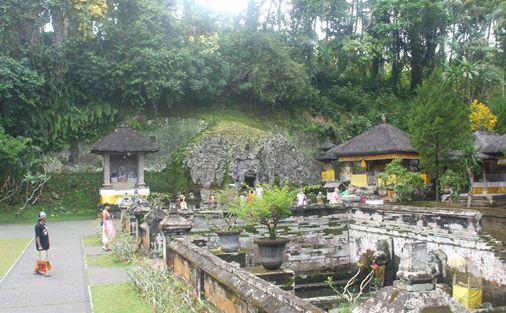 Goa Gajah offers the visitor an interesting experience to explore the cave passage filled with archaeological relics of Hindu and Buddhist such as Trilingga, Ganesa Statue, and Buddhist Statue. There are reliefs carved on the entrance of this cave that looks like a demonic mouth. Hindus believe the reliefs depicting one of the gods in Hindu belief, God of Earth or Bhoma. 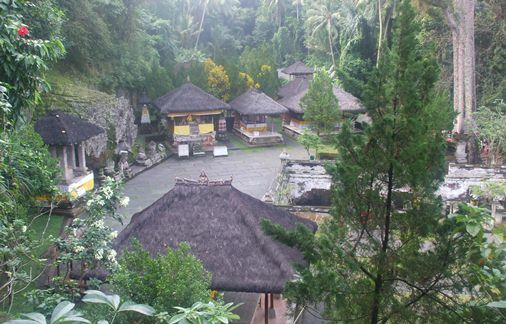 Goa Gajah in Bali is located in Bedulu Village, in the District of Blahbatuh, Gianyar Regency, Bali. Visitor can access this place directly from Ngurah Rai International Airport, about 41 Kilometers (less than 2 hours). Let's take a closer look to this amazing heritage site! Inscription Songan Tambahan, from the year 1022 AD, issued by King Marakata and Inscription Cempaga, from the year 1324 AD issued by King Sri Mahaguru. This both inscription mentions the name of "Er Gajah". Inscription Dawan (year 1053 AD) and Inscription Pandak Badung (in 1071 AD) mentions a sacred place called Antakunjarapadda. Kunjara means Elephant or Gajah. The Book of Lontar Negarakertagama, from the year 1365 AD, compiled by Mpu Prapanca. In this ancient papyrus mentioned literature "Lwa Gajah" (Lwa or Lwah / Loh) which means Sungai Gajah or Elephant River. Currently, the river is known by the name Petanu River, located in front of the temple. At the front, there is a statue of Ganesh, Arca Ratu Brayut and Arca Hariti. And also "wantilan" meeting hall outside the cave. Visitor can walk to the southern end through small cement staircase to find the small stream called Tukad Pangkung (leading to Petanu River). The discovery of the cave started from official reports Indies to the Dutch government by LC. Heyting (1923). LC. Heyting found the statues of Ganesha, as well as statues of Hariti Trilingga. The further research was conducted to follow up these site discoveries by Dr. WF. Stuterhiem in 1925. The reliefs is carved on rocks jutting out with decorative motifs such as leaves, rocks, giant apes and pigs. The cave entrance is located in the middle of this decorative motifs, measuring 1 meter wide and 2 meters high. In front of this cave are carved with a giant face, big round eyes were turned towards the west (right), a large nose, hair and eyebrows looked rough, and upper lip with a series of teeth just above the entrance. Hindus believe that these reliefs is symbolize one of Hindu's God namely Bhoma, God Of Earth. Entering the cave there is a kind of writing that originated in the 11th century, which reads "Kumon" and the bottom line "Sahy(w)angsa". Go deeper, there are cave passages that resemble the letter "T", cave passage eastward and westward. On the north wall of the cave passage transverse to the west, there are seven niches. The biggest niche is facing the cave entrance. There is a statue of Giant and statue of Shiva. At both ends of this cave passage that transverse east-west there are also niches. Niche at the eastern end is a place for Trilingga and a niche at the west end is a place for Ganesha statue. The heritage site in the form of Trilingga and Ganesha statue is the hallmark of the relics of Shiva's teachings. Mr. Conrat Spies (1931) found the quite important relics in the form of a three-pronged stupa carved on a stone wall that had collapsed. 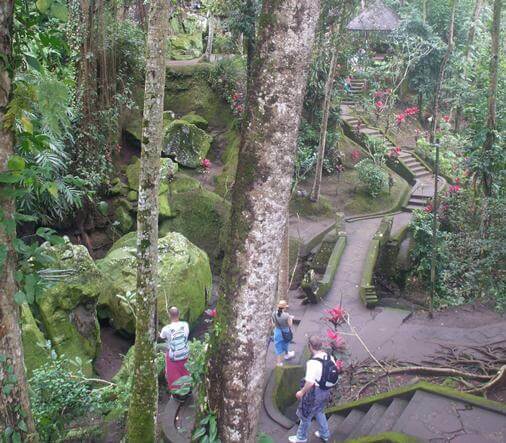 Visitors can walk towards Pangkung River, past the stone steps and arrive at the springs decorated by moss and fern. Around here is the place for huge boulders shaped Buddhist Stupa. The stupa is still lying at the bottom of Tukad Pangkung. These relics of stupa is the hallmark of the relics of Buddhism. The ancient petirtaan pool was discovered through research and excavations in 1954 until 1979. This activity is conducted by the Department of Antiquities of Indonesia through sections of ancient buildings in Bali led by J.L Krijgman. This sacred pool has a size of 12 x 23 square meters and there are statues of "Widyadara" and "Widyadari" which amounted to 6 pieces. Three statues in the north and three statues in the south. All six statue stands on a lotus-shaped sculpture as a symbol of universe. 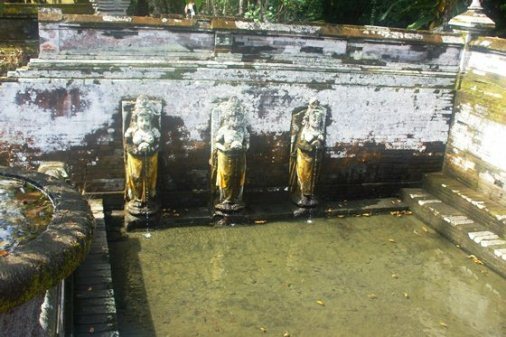 The statues holding a "tirta place" that spout water into the pool. The existence of this sacred pool or petirtan and the six statues is believed to provide the vibration of the aura of sanctification for visitors. Goa Gajah has similarities with The Elephanta Caves that are situated on the Island of Gharapuri or Elephanta Island, Mumbai, Western India. The Elephanta caves are a network of sculpted caves that consist of two groups of caves. The first group consisted of five groups Hindu caves. While the second group is composed of two groups Buddhist caves. The Hindu caves contain rock cut stone sculptures dedicated to the Lord Shiva. The rock cut architecture of the caves was constructed about the mid-5th to 6th Centuries AD. 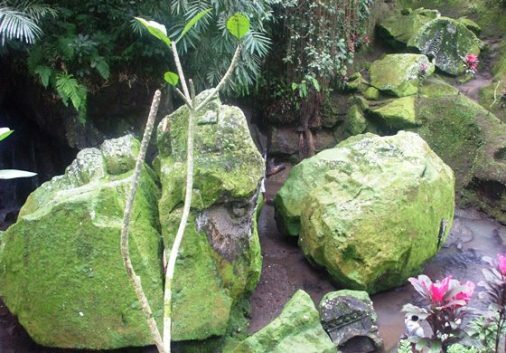 The cave location is close to another tourist spot such as Ubud Palace (nearest touris spot) about 5 Kilometers (15 minutes), Ubud Monkey Forest, Yeh Pulu, Goa Garba, Tampaksiring, Tirta Empul, and Gunung Kawi. Situated in Bedulu Vilage on Blahbatuh area, this Elephanta Caves Bali is influenced by Very Wet Region Climate (A type climate based on Schmidt-Ferguson climate classification maps). Very Wet Region climate in Gianyar Regency has humid season which begin from November continues until August (10 months). Dry month ins September and October. Due to this climate type has long rainy season so there is always water source throughout the year. In addition, the soil in this area is very fertile because of volcanic soils derived from volcanic group Buyan-Bratan-Batur. The abundance water source combine with fertile volcanic soil make the area of elephant cave is most suitable for rice fields. Many visitor come to Bali for capturing the unique rice terrace around this area. This Bali elephant cave was added to the UNESCO World Heritage Tentative List on October 19, 1995, in the cultural category. A World Heritage Site is a place (such as a building, city, complex, desert, forest, island, lake, monument, or mountain) that is listed by the United Nations Educational, Scientific and Cultural Organization (UNESCO) as being of special cultural or physical significance. 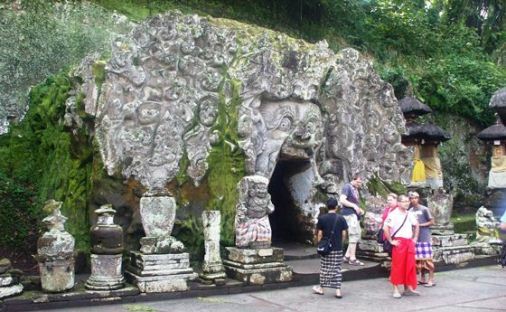 The elephant cave temple keep the Bali history of Hinduism and Buddhism and still preserving it until this moment. Take your time to Travel to Goa Gajah Bali, hopefully helpful and thank you!